The 2017 season had seen our Second XI relegated to Division Three, but following the past 2 seasons when many players left the club, it was rightly seen as excellent opportunity to re-build with younger players,. But many did not forsee that First XI skipper Michael Scarborough would step down to the Second XI to personally supervise their transition into senior cricket. Previous skipper Alan Fothergill kept his promise to retire and take time out to watch his sons pursue their cricket. Five youngsters stood out from 2017 and they would all feature heavily in 2018, they were: Ellis Marshall, Lucas Keslinke, Bradley Powell, Bilaal Khan and Uwais Khan. So Division Three fixture planning decreed we would meet Hepworth & Idle lls at their ground on 28th April. What followed gave everyone confidence that the year would indeed allow the rot to be stopped and the climb-back would be sooner rather than later. Electing to bat first, openers Niall Saynor and Bradley pitched into the fray with a 46 stand before the latter fell for a gritty 26. He was replaced by Bilaal who continued the good start with Niall. the score was 75-2 when Niall was caught for a solid 30. So Michael took up his new Captaincy at his usual number 4 and with Bilaal another 46 was added. Bilaal was also caught, for a highly promising 25 with the score on 121-3. Lucas looked to join in the run-getting and he too didn't disappoint with another 21 alongside the skipper, who was clearly enjoying his new role. Next in was Steve Powell who helped add another 50 as the two experienced batsmen powered 12 sixes from the labouring H & I bowlers. We finally tallied a satisfying 238-6 and champed at the bit to bowl. It was the turn of Ellis to show his mettle and the top three H & I batsmen all fell to his left-arm pace, 2 caught and 1 bowled. At 25-3 the home side were up against it and when Uwais grabbed 3 wickets in 3 overs they finally collapsed completely. Only Garfield Allen with 39 proved able to match our batting. In between Jack Davison had nicked out 3-35 to add to 3-7 from Ellis [6 overs] and 3-11 from Uwais. The Hepworth and Idle final score was 113 all out, and we had a resounding 125-run victory! Sadly the Home match with Thornton-in-Craven [First Xl] was conceded by the opposition who struggled to find players. Pre-season Division Three favourites were Riddlesden [also a First XI] and we would face them down by the River Aire. Oakworth opted to field and copped a 66 run opening partnership from the home side. Mohammed Qadeer was in ominous form and he shared a 108-run stand with Akeel Rashid  and then a further unbeaten 107-run blast with Mohammed Shannawaz . Qadeer personally racked up 152 in a formidable 323-3 tally. Our bowling attack was boosted with teh signing of former ISJ player Sajjad Razak but he too found a breakthrough difficult. Uwais again grabbed a brace for 31 off 7 overs as our best bowler. With the bat only skipper Michael  was able to deal with the Riddlesden attack, who showed why they were promotion favourites. There was another 18 for Lucas [4 fours] in a disappointing 104-9 total. A third First XI in Skipton CI were up next at Wide Lane and this time Oakworth elected to bat. Returnee after several seasons family-rearing, Jon Crossley opened the batting but was given lbw for just 3. Bilaal and Michael forged an 84 run partnership to pick us up, Michael again falling at 46 with our score on 107-3. Robert Hopkinson also made one of his rare appearances and knocked in a much needed innings which had been faltering at 138-6 despite a fine 43 from Bilaal. Robert's 37no held the tail together and we ended at 182-8 after the full 45. It was a pleasing total against a First XI. For CI Steven Woods had been particularly effective with 3-35 and he also got to grips with our attack with an opening 72 runs. The bowlers managed to winkle out 5 batsmen but couldn't halt their march to 186-5 and they took the 3 points with 14 balls to spare. The skipper proved best bowler with 2-39 [8 overs]. On the Sunday there was a second league encounter and Bingley Congs lls were the visitors. Niall set the tone at the top of the order with 8 fours in a cracking 33 and with 18 from co-opener Bradley we got a great start. But Sam Waterhouse got into his stride with 6 wickets for 37 in his allotted 12 overs. Sajjad chipped in a late 19 and with a little tail-wag from Ellis and Uwais we dragged our score up to 118 all out in 40.1 overs. Two early cheap wickets, one for James Lee and a second for Sajjad, gave us hope of upsetting the form-book but no 3 Charlie Raistrick  and Jamie Teale  scotched that premise with a match-winning stand to take the Congs to 123-4 in 38 overs. Pleasingly Sajjad was now finding his feet with 2-22 from 12 tight overs. Our record then stood at 1-1-3 and below mid-table. The following Saturday a trip to Barrowford wasn't perhaps the best fixture to follow three defeats and so it proved as our innings was snuffed out by Marc Atkinson who took 5-16 in 9 troublesome overs. Bradley stood his ground and made a defiant 32, comfortably out-scoring his dad, with Sajjad again in the runs with 16. But 78 all out in 31 overs seemed unlikely to ruffle the Barrowford feathers. And a 62 run opening stand immediately confirmed that supposition. The home side raced to 80-2 in only 9.5 overs. This time it was Sajjad' turn to bear the brunt, conceding 47 in just 5 overs. But as the temperatures mounted so our spirits were lifted with a home derby against Haworth the next prospect. Again we won the toss and elected to bowl first. And a terrific containment job was executed by our five bowlers. Principal amongst them was Bradley who took the two openers and then picked up a further 2 in his second spell to finish with 4-36 in 8.2 overs. Sajjad picked up a couple including Oakworth junior manager Michael Thompson  who was helping Haworth retain their Second XI. The Haworth number 11 was Ollie Bishop who added 12 against his former team. Whilst four Haworth batsmen exceeded 20 nowne reached 25 and their ultimate tally of 147 all out, gave our boys a sniff at a possible 3 points. Early losses of Bradley, Bilaal and Lucas were soon overcome with a match-winning stand by Michael [56n] and Robert [52 no], both turning back the clock to their glory days. Haworth skipper Danny Spencer had done a grand job taking 3-17 for the 'Meths' but there, their success ended. The winning runs came at 151-4 after 41.2 overs and we had a second win, a derby day victory to savour. Our record now was played 7 for 2-1-4. Next came our visit to Ryshworth Park and the fixture against Crossflatts lls, rarely an easy ride. Putting in the opposition again, our bowlers did well and with the 'Flatts on 137-6 a reasonable score to chase seemed on the cards. No 5 Kieran Temprell remained resolute making exactly 50 off 58 balls, after opener Mick Brooksbank set their innings going with 45. Bradley again led the attack with 3-45 and with an amazing 1-11 from 8 frugal overs from Ellis, Oakworth showed great fight as the 'Flatts made 180 but were bowled out inside 43 overs. The loss of 2 wickets for 15 wasn't the start we needed but Bilaal dug in to build yet another partnership with Michael. The youngster struggled to score but nevertheless helped engineer a 50-run stand before he f ell to a catch by Charlotte Boulton for Bryan Freimanis. Michael , Lucas  and Steve  occupied 20 over between them and they carried the total on to 125-7, leaving 54 to win for the tail. That task proved too difficult and we ended at 131 with over 6 overs remaining. Charlotte claimed the player-of-the-match accolade with 4-19 and 2 catches, although the difference was Temprell's knock. 2-1-5. Sutton II came calling and were again inserted. This time it was Oakworth struck early taking out the first 3 batsmen for just 5 runs, 2 to Ellis and 1 to Bradley. Sutton number 4 Danny Ridehalgh proved immovable and he carried his bat for a sterling 76 not out. But the Sutton support came only from skipper Mark Stoneman , the rest contributing only single figures to conclude after 38.3 overs at 121 all out. Ellis proved top striker with 4-23 in 12 overs whilst Bradley and Michael each had a pair to celebrate. In contrast the Oakworth batsmen really got on with it and reached the target in 18 overs. Openers Niall  and Bradley  put in 1 46 stand before Bradley was caught and bowled by Blackwell. Niall paired with Lucas until offering a catch at 58-2. Thereafter Lucas and Jordan Powell made hay adding 66 unbeaten runs, 43 to Jordan including 4 fours and 4 sixes. Lucas scored 26 with five 4s. The 3 points were very welcome and our record improved to 3-1-5, with hopes of a mid-table now improving markedly. The fourth First XI of the season to take on Oakworth was Bradley and again at Wide Lane, a cracking match unfolded in extremely warm weather, said the best summer since 1976. The skipper had little hesitation in batting first. It proved inspired. A 35-run start from Niall  and Bradley was fine but paled with the contribution from Bradley and Bilaal. The two juniors conjured up an 83-run partnership taking the score to 118-2 when Bradley was bowled by Grant for a superb 58. The entry of Jordan was keenly awaited after his efforts last week, admittedly against a poor Sutton side. Another 123 runs flowed at break-neck speed until at 241-3 Jordan's blast ended on 81 bowled by Andrew Greenwood. But Bilaal strode on with Lucas, together adding another 39 runs. Lucas did a grand job keeping up the momentum from Jordan's stay with his 30 runs. The skipper put in an appearance and helped Bilaal carry the score from 280-4 passed the 300 mark to 301-4 in the 45 overs. Bilaal was 78 not out at the end and surely his maiden century cannot be too far away on this evidence. All the Bradley bowlers too some stick but once they started to bat the visitors also took full opportunity from the bone-hard strip. The Bradley side, like Oakworth, included a number of young players and Harry Andrews showed the 'chip off the block' and made 31. But it was George Bell who really caught the eye, belying his youth to anchor the Bradley response. Our bowlers also found wicket-taking at a premium. Craig Tempest added 30 for the South Craven side and then Toby Meynell chipped in a really mature 42 to speed the scoring rate. Bradley hadn't finished and when the sixth wicket fell, many felt their resistance had ended. But not so. Even though youngster Bell was no longer there, his innings ended at 90 with catch by keeper Lucas off the skipper' Michael's ball. 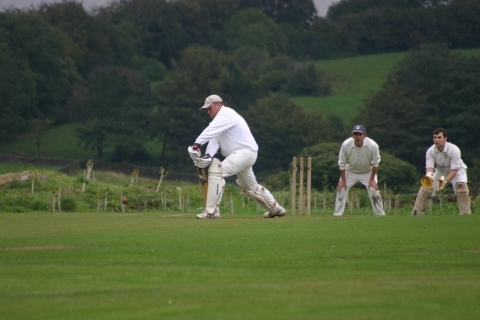 But young Meynell and skipper Vince Grant continued to take the match to Oakworth. although they were behind the required run-rate. They ended at 275-6 in a match of 576 runs, defeated but very proud of their efforts. A consecutive win was great for our boys and we now stood at 4-1-5 in mid-table. With many fine performances at Shires Lane under his belt, skipper Michael added a neat 60 runs for the Second XI in a 153 all out team total. He had support from Steve on 21 but the Embsay II bowlers did well in conjunction with old timers Steve Speak and Andy Hodgson. Sajjad maintained good form with 2-26 from 12 overs but the younger lads remained wicket-less. 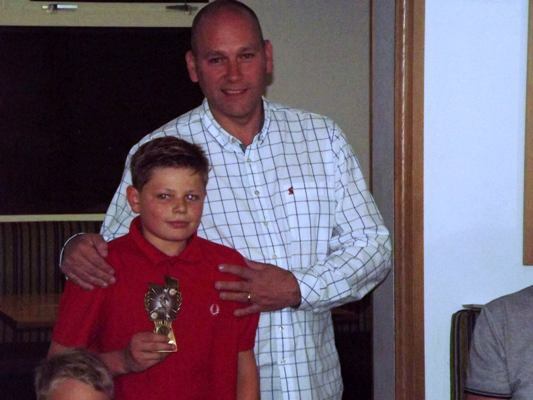 Junior George Arkwright  teamed up with old stager Brian Hodgson who cracked 62 runs at a run-a-ball. Embsay reached 159-4 with almost 10 overs un-bowled. 4-1-6. The Sunday Cowling Cup-tie with Sutton raised hopes of progress in that competition. Danny Ridehalgh again was a hurdle we couldn't leap with another 51 runs. This time Kane Booker  backed-up and Sutton reached 120-7. Brannan Lawn made a rare appearance with even rarer bowling to claim 2-10 with Sajjad picking up 2-28. In the absence of Niall, Lucas was promoted to opener and he cracked in 26 at the start before Michael [47no] and Steve [30 no] saw off the total with 26 balls to spare, to help the side reach the Quarter-Finals. Beckfoot staged the return with Bingley Congs with the home team batting first. Jamnie Teale  once again proved a torment but the 67 from Matthew Brian was a real barrier to stopping the Congs doing the double. Their 183-7 was a tough challenge but one the boys were up for. Tom Fothergill had snaffled 3-55 with his off-spin to help peg the Congs back and Uwais returned to form with 2-37. With bats in hand the boys showed real determination with everyone contributing well. Michael led from the front with 49 and with 29 from Bradley and 27 from his dad Steve, surely Oakworth would go close to the winning line. Paul Carter and Tom ensured that was the case as we posted 185-7 in 41.2 overs to claim the 3 points. 5-1-6, almost parity. The re-match with Hepworth & Idle offered the opportunity for that parity at Wide Lane. They won the toss and chose to bat first. And a decent job they did too. Sean McEvoy was their lynchpin with 84 but with solid support across their line-up 219-6 was posted amidst the heat-wave. Back at the Lane, Niall fell early for just 1, but then the battters got down to serious chasing work. Bradley and Bilaal added 121 for the second wicket, Bradley falling for 50. Bilaal and Jon Crossley added another 52 before the youngster was 3rd out for 59 at 185-3. Only 34 was needed for a season's double over the Shipley side and Jon [58 no] with the help of under-13 Lewis Brown  did the job in style. The 222-4 came up in only 33 overs to underpin the complete dominance our batsmen had over the visiting bowlers. 6-1-6 and we were establishing ourselves nicely in Division Three. The comfort-bubble though was about to burst, big style although our 180 all out at Thornton-in-Craven seemed a decent effort against a First XI. Bilaal continued his fine stroke-play and form with another 58 and Jordan's 48 following 36 from Niall enabled the total. Evergreen Mark Laycock returned 4-31 alongside 3-45 from Ian Holden applied the brakes. Any dreams of a third win in a row were well and truly scuppered by Daniel Oldfield who blasted 119 not out with 18 fours and 5 sixes along the way. The 42 from Dan Ibbotson saw the West Craven side to 181-1 after only 28.2 overs. Next up a third battle with Hepworth & Idle 2nds in the Cowling Cup Quarter-Final provided opportunity for a third win and progress to the Finals day. Oakworth put the home team into bat and they posted 119-6 despite 2-19 from returnee Harry Hollingsworth and 2-24 from Tom. The 20-20 format was very much a leveller and the H & I bowlers picked up wickets steadily as our lads chanced their arm in the chase. Form-man Bilaal top-scored with 19 with Steve on 17 and Lucas opening with 16. But the middle order and tail fell away badly from 64-3 to 102-9 after 3 run-outs [Lewis, Paul and Tom]. Over at Sandylands, back in league action, Skipton CI chose to bat first and ran into top from from Sajjad [3-20] and Bradley [3-26], Five of their batsmen reaching double figures but none of them reaching 20. Their 131 all out was distinctly vulnerable and 29 from our openers set us well on the way [Niall 16 and Bradley 6]. Bilaal and Lucas fell for little addition but Michael stayed focussed to reach 47 not out. The additional push came from Matty Lee  and Steve  for us to reply with 133-6 from 39.2 overs, although Sefal Alam 3-34 did his best to block our path. 7-1-7, 22 points and 7 matches left to make yet more inroads to the Division. The home match with Barrowford was likely to be a real tester and the visitors did not allow much rope. Michael again top-scored with 47 but this time only 17 from Bilaal showed any depth to our knock and tally of just 101 in 36.4 overs. Three wickets each for both Andy Makin and Arsalan Ali did the damage. Mohammed Waqas ensured no slip ups for teh Red Rose side with 63 not out in a 105-2 reached in only 87 balls. 7-1-8. The following day Oakworth would again face Barrowford lls in teh Cowling Cup semi-final as we had been re-instated after the league learned H & I had played an ineligible player. The result was the same but the result a little closer. Skipper Michael led our bowlers with 3-24 and both Tom and Sajjad picke dup a brace apiece. Barrowford posted 145 all out [Abdul Mannan 35 and Mohammed Waqas 25]. Bilaal led our response with the day's brilliant top score of 43 and with back-up from Robert and Lucas we edged nearer the target. We finished 19 short on 126-9 but we had given the favourites a run for their money. Next we were to face high-flying Riddlesden who recognised the threat of bad weather and declared their innings at 222-1 with three half-centurions contributing. Oaks innings lasted 17 overs before the rain brought an end to proceedings with our stodging having reached 14-2. 7-2-8. Having claimed an early season derby day win over Haworth, the boys were ultra-keen to take a double from our cross-water rivals. Our bowling was tight and Haworth whilst losing just 7 wickets could not up the run-rate above 3 per over. Anthony Haigh was top batter with 35 and there was 20 from veteran and former Oak Dave Walsh but the wily leg-spin of Matty countered any threat with 3-21 [10 overs] 2 more for Sajjad ensured Haworth could post only 122-7 in their 45 overs. But our youngsters would not be denied and none mor so than the youngest Powell, Bradley who rattled off 12 fours and 3 sixes in his 8-0 not out to almost single-handedly destroy the Haworth bowling. With 18 from Niall and 13 no from Bilaal swept us to 127-1 off just 29.3 overs. A double-derby season and level again at 8-2-8. Crossflatts lls asked us to bat first and it proved a match-winning decision as we were able to post only 71 all out in the face of the visitors excellent bowling. Bryan Freimanis 3-10, Vijay Amirtharaj 3-20 and Mark Pennington 3-21 completely undermined our lads. Jordan bashed 26 [four 6s] and Michael 17 in the low total. The bowling stint afforded a debut for leggie Charlie Raby and he picked up his first wicket [Half-centurion in May, Temprell] in his 1-14 from 6 overs spell. Bradley too wasn't giving up and he grabbed 2 for 5 in his 6 overs, whilst Harry H took the other for 25 in 5 overs. So we took 4 wickets as Flatts got the points with 73-4 in 20.1 overs. 8-2-9. 3 to go. The lovely Royd Hill ground and spanking new pavilion was the venue for us to again try and get back to parity. It was a day to remember for two of our bowlers. Uwais claimed 5-33 to restore his early season form and Harry showed top form with 4 for 10 in 7 overs. Sutton lls subsided to 83 all out. two more of the junior brigade, Bradley  and Lucas [25 no] leading the victory charge at 84-3 for the third time against Sutton in 2018. 9-2-9 and 28 points. The long hot summer finally came to an end on 8th September and the match at Bradley was ruled out by the rain. 9-3-9. The final league match was against Embsay lls who bowled first. Michael came in at no 7 and added 46 to his season's excellent tally with Steve adding 23 in the 115 all out post. We had been shackled by Shahid Mahmood 4-20 and 2-26 from veteran Steve Speak. George Maloney , Paul Wormald  and George Arkwright  did enough to quickly pass our total in 30.4 overs on 116-5. Charlie Raby again shone with 2-37 from 8.4 overs. So the league season ended with 10 wins [inc 1 concession], 2 draws and 10 defeats; a very satisfying halt to the team's decline, auguring well fro 2019 and the push towards the top. The concession was awarded by the league against Barrowford. The 11 home league matches brought 5 wins [inc a concession by Thornton], 1 draws and 5 defeats; whilst on our travels we picked up 5 wins, a draw [Bradley] and 5 defeats . 7th place was actually obtained but due to league penalties for failing to turn out a Third XI, 10 penalty points were incurred which pushed us down to 9th. Nevertheless the Captain can be pleased at the overall progress in both batting and bowling, and the degree of development by the five young players, the very promising debut from Charlie and the return of Harry. At Wide Lane we scored only 1,385 runs for the loss of 61 wickets in the 8 matches in which we batted [exc v Riddlesden]. An average score of 173 and batting form of 22.7 was certainly significantly ahead of 2017 [97 & 10.3]. Our opponents scored 1,413 runs, losing 72 wickets [we captured just 41 in 2017]. Only 4 teams were bowled out. The visitors average score from 10 innings on the Wide Lane strip was 158 with scoring at an excellent 29.9. Our visitors relished the productive Wide Lane strips as we captured 61 wickets, only 7.6 wickets per match. Visiting bowlers out-performed our young lads, taking 61 wickets at a cost of 22.7 runs for each scalp. Away from Oakworth the story was: 1,413 runs scored [up 412] in 10 innings for loss of 72 wickets [85 in 2017]. An average away score of 141 [up 29] is way ahead of 2017 and brought 5 good wins. Our scoring rate was 196, still with room for improvement but again way ahead of the 11.8 last year. This came about by improved defence losing only 7.2 wickets each trip. Our hosts scored 1,555 runs [down 111] and lost 64 wickets [up 8], so the bowlers can claim their share of the progress striking more often and reduced the run-scoring from 29.5 in 2017 to 24.3. Rising star Bradley Powell appeared in all 20 matches played with his best a spine-tingling 80 not out. His run tally was exceeded only by Captain Michael Scarborough whose 19 appearances enabled him to amass 571 runs [best 90] at an average of 57.10 which brought him the Divisional batting award. Also with 19 turn-outs Bilaal Khan showed his emergence as a top order batsman [best 78] as his leg-spin faded into the back-ground. With a best of only 36 Niall Saynor found going on from his starts his principal issue but nevertheless he tallied 236 runs at 14.75 as the experienced foil to youngsters Bradley and Bilaal. Lucas Keslinke was a fourth player to turn out 19 times and his season concluded with a best of 30. In only 7 matches for the Second XI elder brother Jordan Powell blasted 198 runs [best 81] as an infrequent shock tactic! His dad Steve Powell provided consistent support with 173 runs [best 30] at 17.30 from his 17 appearances. Uwais Khan also appeared 17 times but his contribution was with the ball, not the bat with which he tallied just 12 runs from his 9 innings. Jon Crossley pitched in 74 runs and Robert Hopkinson 93 in cameo appearances during the year. New boy Sajjad Razak appeared 12 times and whilst principally a bowler, added 68 with the bat. Sadly 2018 was the last year at Oakworth for Ollie Stell, who left for Ingrow after just 4 appearances. Good luck Ollie. 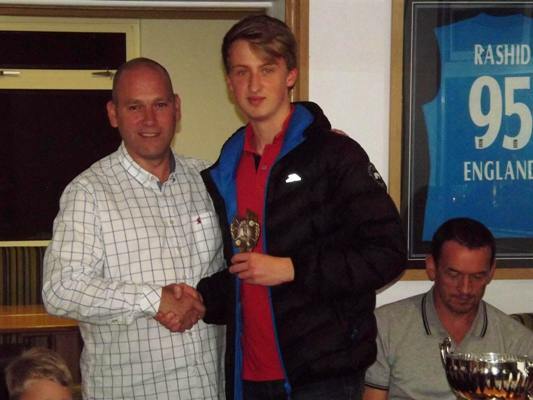 Ellis Marshall was promoted to the First XI after 8 appearances for the Second XI. All in all, a total of 29 players wore the two-tone blue of Oakworth 2nds in 2018. Topping the run-scoring in 2018 was the skipper Michael Scarborough's 571 [3 fifties] with his best of 90 against Hepworth & Idle in the opening fixture. The more solid back came from opener Bradley Powell with 395 with an average of 21.94 with a calmer approach paying huge dividends of three 50s. Not far behind was Bilaal Khan now proving to be far more than a leg-spinner that can bat a bit. His 371 runs, usually from no 3 was testament to the prodigious talent he possesses. His average of 24.73 was bettered only by his captain. Our other opener Niall Saynor tallied 236 runs at 14.75 providing the experienced foil for Bradley and Bilaal to shine. Lucas Keslinke started tom show his talents both with his wicket keeping and his vastly more consistent batting with 211 runs, average 14.07. Jordan Powell showed his First XI potential with 198 runs in just 4 knocks, averaging an amazing 66. His dad, veteran Steve Powell turned the clock back a little with 173 runs at 17.30. The lower order batsmen chipped in well with Sajjad Razak , Lewis Brown  and Paul Carter  the most prominent. Returnees Robert Hopkinson  and Jon Crossley  began the blwpoing away of cobwebs with mixed results. The bowling attack, was always going to be the most difficult to provide improvement but the total wickets taken was 117 compared to 97 in 2017, a terrific development for the attack. Leading the way was Bradley Powell, a genuine all-rounder, with 20 wickets at 31.90 and a best of 4-36. Our mystery spinner Uwais Khan continue his steady development and took 19 wickets at 28.58 and a fabulous best of 5-33 against Sutton. The two young bowlers had back up from newcomer [former ISJ player] Sajjad Razak with 18 wickets at 23.28. The skipper Michael Scarborough added in 14 at 18.86, bowling less than 80 overs to allow the youngsters opportunity to get overs into their legs. Ellis Marshall  and Tom Fothergill  both excelled but were soon upgraded to the First XI. 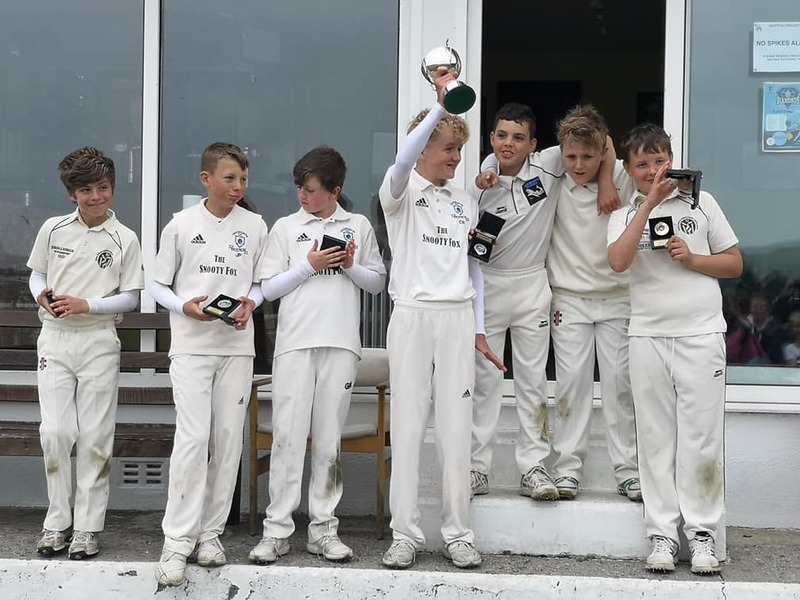 A string of junior bowlers all took wicket including back at Oakworth Harry Hollingsworth, Bilaal Khan and Matty Lee with a successful debut season for Charlie Raby. The wicket-taking rate was similar to that in 2017 [5.6 per match] but last year each one cost over 33 runs whilst this season more experience has brought that down to under 27. Captain Michael Scarborough and Bradley Powell each managed 9 fielding victims with dad Steve in 3rd place with 8. Lucas Keslinke doubled his keeping victims number to 12. For 2019 the team having settled well again in Division Three will look to progress up the table, building on the 10 wins without the penalty of points deduction for the Third XI. The squad has a good balance with experience from Michael, Steve, Niall, Sajjad, Robert and Jon. The younger lads Bradley, Bilaal, Lucas, Uwais and Charlie should now be looking to really make their mark. As always there are more younger players in teh pipeline with Subhaan Ahmed, Jake Keslinke, James Powell, Jacob Davies, Charlie Jackson and Jacob Stephens all progressing nicely, most already blooded in the Third Xi.